﻿﻿﻿Pulitzer Prize-winning poet Kay Ryan—the U.S. Poet Laureate from 2008-2010, who just a few weeks ago received a MacArthur (“genius”) Fellowship award--will be the featured guest at the 2nd annual Morton Marcus Memorial Poetry Reading, Sunday, November 20, at 3 p.m. in the UCSC Music Recital Hall. The event is held each year to honor poet, teacher, film critic, and Santa Cruz cultural icon Morton Marcus, who passed away from cancer two years ago (1936-2009). It’s a true community event—sponsored by a partnership between UCSC, Cabrillo College, Poetry Santa Cruz, Bookshop Santa Cruz, and the George Ow family. Admission is free, and everyone is welcome to attend. Hosted by UCSC humanities lecturer and Santa Cruz’s first ever poet laureate Gary Young, the afternoon will feature Ryan reading from her own work, plus readings by Shirley Ancheta and Jeff Tagami. As an added bonus this year, UCSC’s Special Collections will present a special exhibit prior to the reading at McHenry Library--from 1 to 3 p.m.--offering the first look at the personal archive of Morton Marcus. Gifted to UCSC in 2010, the Morton Marcus Poetry Archive is slated to open in January at Special Collections. “It’s a quick peek at the archive which people can see in its fuller context in January,” said Christine Bunting, head of Special Collections. “We will have examples of Mort’s literary works, manuscripts, photos, personal correspondence, and poetry broadsides. We’ll also have some images projected on our screen and will have some of his recordings as well,” Bunting added. “He worked for about a year before his death, preparing and organizing his collections for us,“ she noted. Marcus also donated his personal library, which includes 1,300 works of poetry, as well as 204 audio recordings of interviews that he did with other poets. Special Collections already holds the personal libraries of such renowned poets as Lawrence Ferlinghetti, George Hitchcock, and Kenneth Patchen. It also has an endowment for poetry named in honor of poet and teacher William Everson, who served as master printer for the Library’s Lime Kiln Press. In August, UCSC additionally received a gift of $500,000 to establish The George P. Hitchcock Modern Poetry Fund at Porter College, in honor of Hitchcock, who died in 2010 at the age of 96. His longtime partner, Marjorie Simon, made the gift to honor and fulfill Hitchcock’s wishes—to establish an endowment, through his estate, that would support poetry-related activities in perpetuity on the UCSC campus. Bunting noted that Simon has now decided to also donate Hitchcock’s personal papers to Special Collections, last month giving the campus his correspondence, business and family materials--plus the complete run of kayak, his literary magazine. 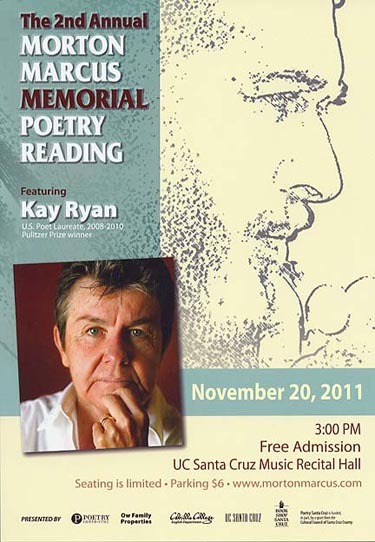 The aim of Sunday’s event is to bring an esteemed poet to Santa Cruz County each year to read and meet with the public. Ryan, who has received remarkable acclaim for her work, certainly fits the bill.